"First published December 2000. 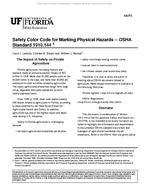 Reviewed November 2008"
Safety Color Code for Marking Physical Hazards -OSHA Standard 1910.144 2 for the complete standard and for court interpretations of the standard. Section 1910.144(a) -Color Identification 1910.144(a)(1) -Red. Red shall be the basic color for the identification of: (i) -Fire protection equipment and apparatus. [Reserved] (ii) -Danger. Safety cans or other portable containers of flammable liquids having a flash point at or below 80 deg. F, table containers of flammable liquids (open cup tester), excluding shipping containers, shall be painted red with some additional clearly visible identification either in the form of a yellow band around the can or the name of the contents conspicuously stenciled or painted on the can in yellow. Red lights shall be provided at barricades and at temporary obstructions, as specified in ANSI Safety Code for Building Construction, A10.2-1944, which is incorporated by reference as specified in Sec. 1910.6. Danger signs shall be painted red. (iii) -Stop. Emergency stop bars on hazardous machines such as rubber mills, wire blocks, flat work ironers, etc., shall be red. Stop buttons or electrical switches on which letters or other markings appear, used for emergency stopping of machinery, shall be red. 1910.144(a)(2) -[Reserved] 1910.144(a)(3) -Yellow. Yellow shall be the basic color for designating caution and for marking physical hazards such as: Striking against, stumbling, falling, tripping, and "caught in between." Note: Some sections of OSHA standards are labeled "Reserved." This label implies either that information has been deleted from the previous version of the standard or that additions to the standard are anticipated. Because standards often reference other standards, it is important that paragraph numbers remain consistent.